The studies here deal with the first half of the period of almost four centuries (1191-1571) when Greeks, Latins, and other groups coexisted on the island of Cyprus. Under the French-speaking Lusignan dynasty, the Kingdom of Cyprus gradually evolved from a fragmented cluster of indigenous and alien linguistic and religious communities to a more unified yet still multicultural society of Cypriots by the end of the reign of King Hugh IV (1324-59), a process that was redirected in the wake of the Genoese invasion in the 1370s. The ecclesiastical history of Early Frankish Cyprus has traditionally been seen as one long national (Greek) struggle against foreign (Latin) efforts at forced doctrinal and ritual assimilation. 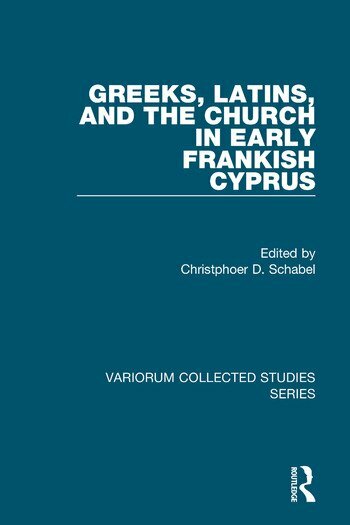 In this volume Dr Schabel presents a more nuanced view, with new interpretations of general trends and specific events in the history of the Greek and Latin clergies on the island, the involvement of the crown, the papacy, and the eastern and western emperors, and the relations among these groups and individuals. Contents: Preface; The status of the Greek clergy in early Frankish Cyprus; The myth of Queen Alice and the subjugation of the Greek clergy of Cyprus; Martyrs and heretics, intolerance of intolerance: the execution of 13 monks in Cyprus in 1231; The Greek bishops of Cyprus, 1260-1340, and the Synodikon Kyprion; The Latin bishops of Cyprus, 1255-1313, with a note on Bishop Neophytos of Solea; Frankish Pyrgos and the Cistercians; The inquisition against Peter de Castro, Vicar of the Dominican province of the Holy Land in Nicosia, Cyprus, 1330 (with Christina Kaoulla); Elias of Nabinaux, archbishop of Nicosia, and the intellectual history of later medieval Cyprus; Archbishop Elias and the Synodicum Nicosiense; Hugh the Just: the further rehabilitation of King Hugh IV Lusignan of Cyprus; Addenda and corrigenda; Name index. Christopher D Schabel is Associate Professor at the University of Cyprus, Cyprus.